When I was a small child, there was a really neat local store in the old part of town that kept a lot of colourful little toys that I never found anywhere else. Maybe I’m conflating memories from a time I’ve long forgotten, but I’m pretty sure that here, in a big, white bin, they had a whole bunch of tiny robots with detachable parts. I’m pretty sure they were all that weird fleshy colour, like Kinnikuman or M.U.S.C.L.E. or whatever you want to call them. We ended up with a variety of these things. 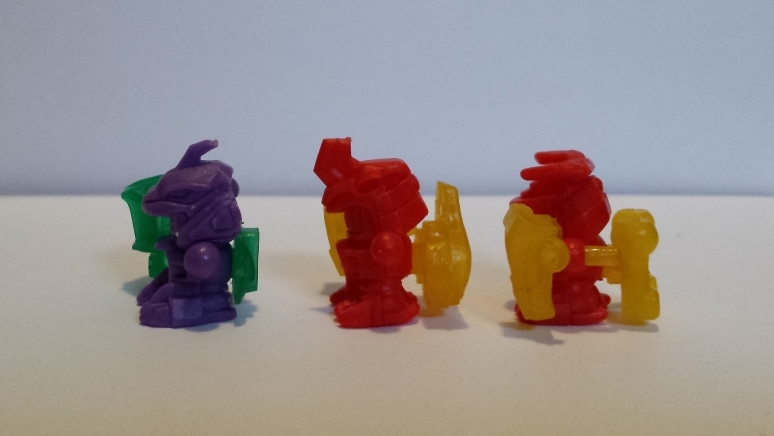 You could take the pieces off and swap them with other robots however you wanted. I kind of feel like I probably never did that, though. I just liked to collect colourful things. 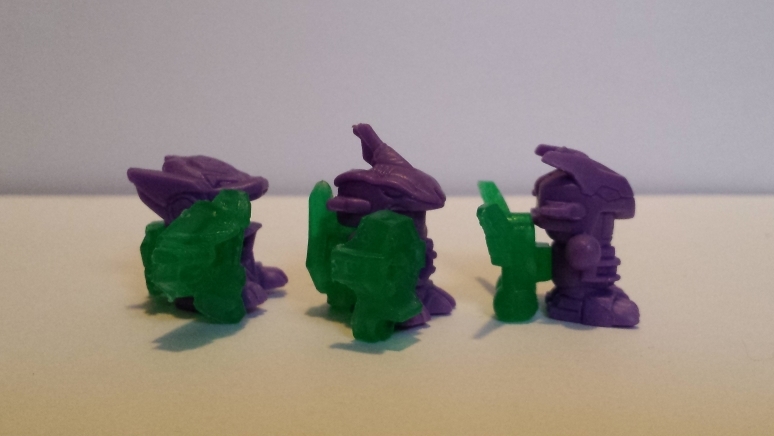 Also, I’ve always been pretty persnickety about keeping swappable toys together in the way they’re designed to be. Even LEGO sets. Yes, I’m that kind of person. These Bomberman figurines kind of remind me of toys like that. The difference is that they have less swappable parts, they’re probably a lot more intricately detailed, and they could never have been sold here in the States because this country has clearly never had a refined enough taste to properly appreciate Bomberman. I actually didn’t even know that these existed before I got them, as I’ve never seen them on any Japanese sites like so many of the keshi. I only have them because a close friend of mine bought them in a huge bundle of keshi and sent them to me. What a sweetheart. Anyway. 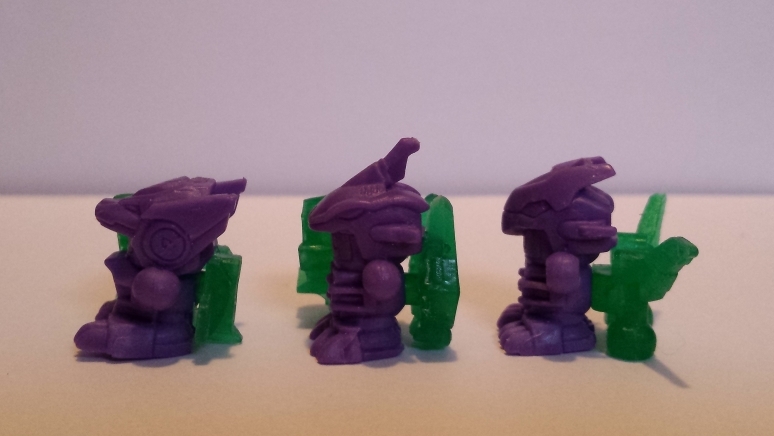 I did a lot of digging and actually found out which real, full-scale B-Daman figures these are meant to represent! So while I don’t know how these things were bought (with candy, or in a gachapon machine, I assume? 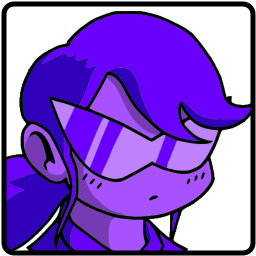 ), I can still give you a pretty knowledgeable review of them. Alright, so first of all, let’s talk about B-Daman. 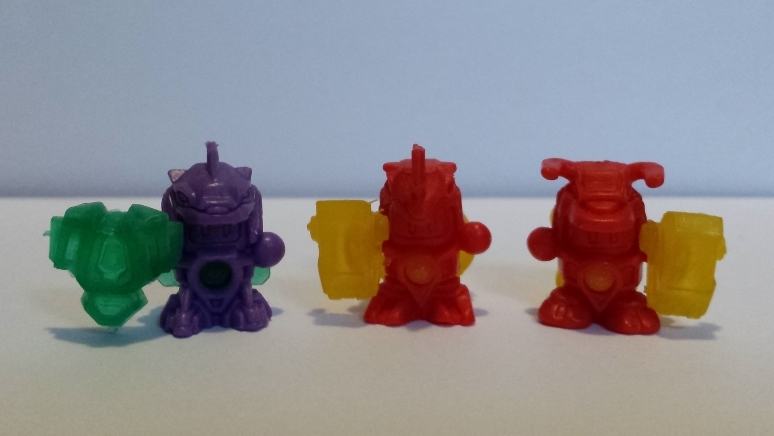 B-Daman figures are little robots or characters who have holes in their stomachs. A marble fits into the hole, and you can press a trigger on the back to send the marble shooting off. You may be aware of the more generic ones that exist now, but they began as a line within the Bomberman franchise! The first were just normal Bombermen, but then they started adding attachable armours and big mechs and things. 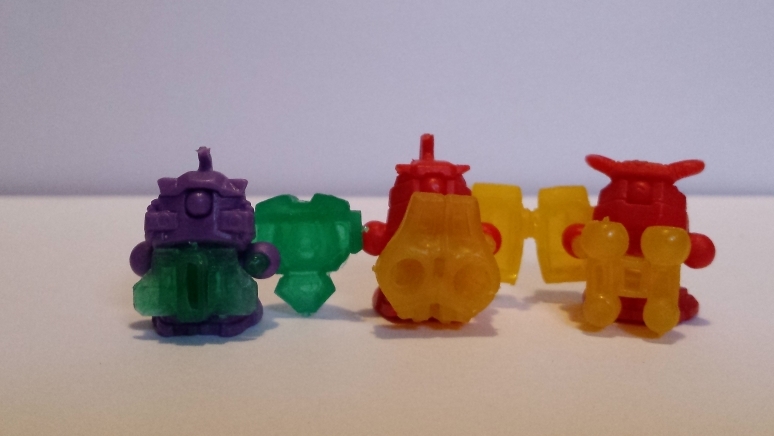 These minifigures I’m showing are representative of a line of animal-themed armours in the Super Bomberman B-Daman line of toys. As far as I’m aware, they came in two sets of three, and each set could be pulled apart and reconfigured into a giant combination mech with the little Bombermen piloting them. From left to right, we have Leo Bomber Mail (61), Shark Bomber Mail (62), and Eagle Bomber Mail (63). You’ll notice that my Eagle Bomber Mail is missing his shield. How unfortunate! But them’s the breaks when you’re dealing with tiny, decades-old toys. It should look basically identical to Shark Bomber Mail’s shield, judging by the box art I have. They’re all hard plastic and very lightweight. 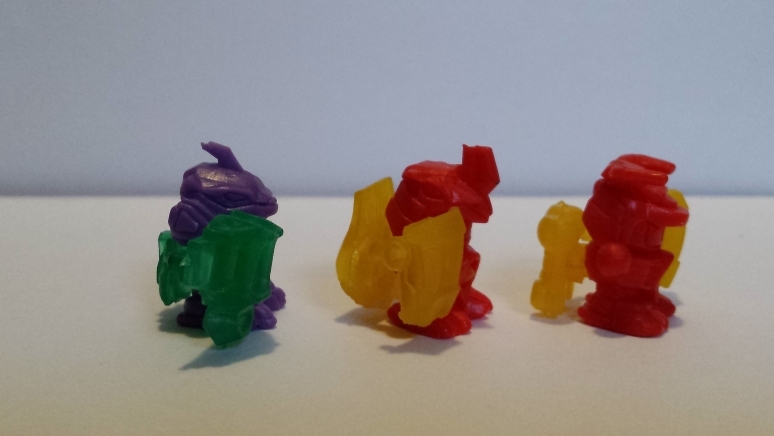 The bodies are solid purple or red, while the attachments are translucent green (for the purple figures) or yellow (for the red figures). The pieces are simple peg-and-hole things, and they’re easily swappable with the other figures, unlike the capes and stuff in the Bomberman keshi line. Also, it’s kind of neat how they’ve set up the back attachments so that their pegs run through the bodies and create the illusion that there are marbles sitting in there. There’s a lot of attention to detail in the designs here. The shields are even all in the proper hand for each figure, matching their regular B-Daman counterparts. From left to right, they are Wolf Bomber Mail (81), Rhino Bomber Mail (82), and Ox Bomber Mail (83). It’s kind of strange that these guys are Water and not Fire, especially since there’s a shark guy in the Fire set. Who knows what the theming here was, though. I would guess that this is the full set, as the other B-Daman figures between 63 and 83 seem to be completely unrelated, such as mail for the Shitennou of Super Bomberman 4. I suppose it’s possible that other figures were made for this set, but I currently have no way of knowing this. If you have any legitimate information on the subject, feel free to drop me a line here in the comments, through the submission form, or on social media. I should probably also mention that, since the corresponding B-Daman figures’ boxes mention Bagura Head (the final boss of Super Bomberman 4), and Super Bomberman 4 figures came immediately after the Fire Mail set in the lineup, this places the date of these toys’ release circa 1996. That’s all I have for now. I hope you’ve enjoyed this rare glimpse into Bomberman‘s more obscure merchandise! Thanks for reading!